Bottoms are processes, not points – and, globally, that’s going to take some time as long as the economic data and market prices continue to lean bearish. As we look at today’s set up for the S&P 500, the range is 64 points or -2.39% downside to 1097 and 3.31% upside to 1161. 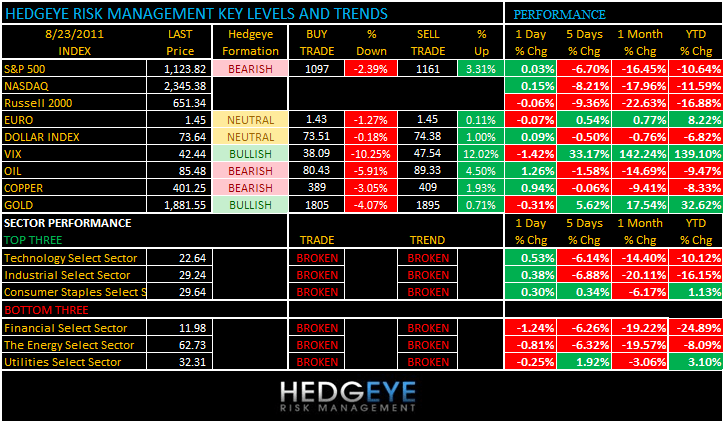 UST YIELDS – The Hedgeye downside target in the 10-year was hit right on the nose on Friday (2.06%) and now you’re seeing the proactively predictable bounce in bond yields that is inversely correlated with Gold/Silver; remember Gold/Silver really outperforms when real-rates-of return on bonds are negative; the immediate-term TRADE range for 10s is now 2.01%-2.19%; manage risk around that range. New homes sales in the US due out this morning should be another bearish data point for both Americans and the financial stocks. STAGFLATION – begging for the Bernank to QE3 us is keeping a lid on any USD recovery and that’s a problem for Sticky Stagflation – yesterday the CRB Index was up 2pts on the day and this morning commodities are in many cases outpacing equity market gains. 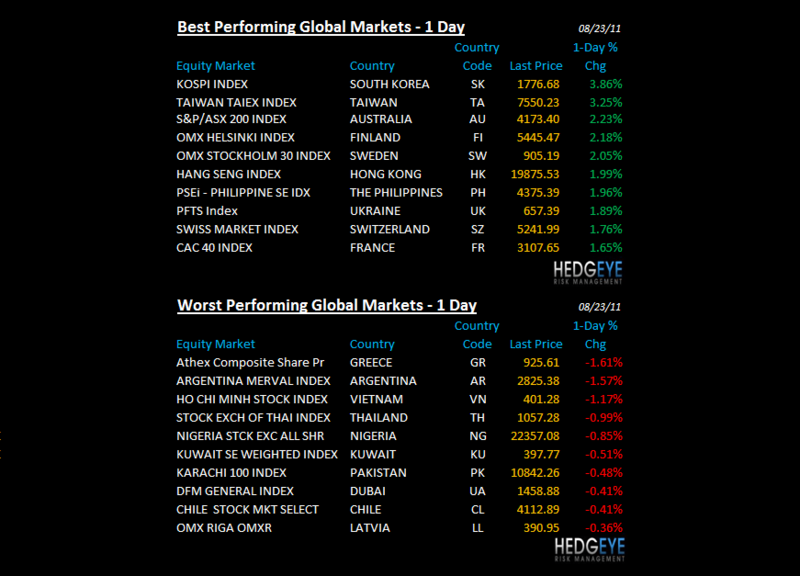 We will get less bearish on Equities, globally, when Oil is at $72. 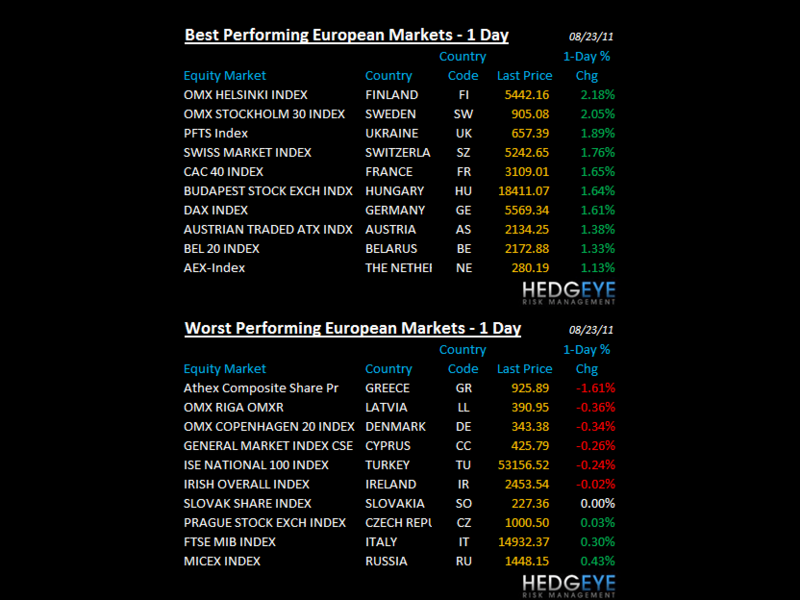 EUROPE – PMI numbers across the board for August are plain bearish, but markets have been pricing that in so we’re seeing another low-volume, low-conviction, rally in everything that’s been going down (other than Greece, which is down again this morn and down -45% since FEB); most interesting number was France dropping below the 50 line on PMI; GDP expectations in France (and their AAA rating) need to come down. 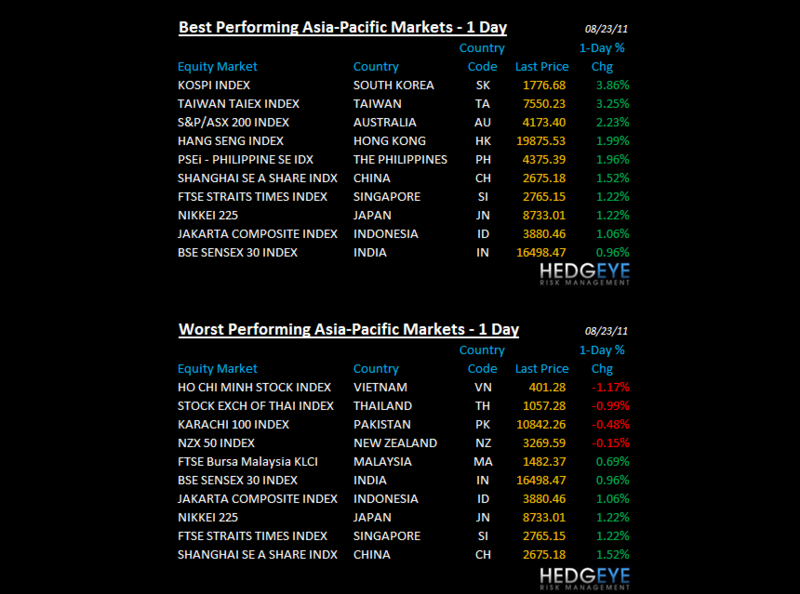 ASIA: China put up a better than bad number last night and stocks stopped going down +1.5% overnight; Korea stopped crashing, which is nice. HSBC Flash Manufacturing PMI for China beat expectations and came in higher m/m, still indicated a contraction.